Zen Planner strikes the right balance between feature richness and usability. Given its rich set of features and its intuitive interface, Zen Planner is a top option for fitness membership management software, ideal for small/mid-sized single location fitness businesses. Is Zen Planner the right software for you? Trusted by over 5,000 fitness businesses, Zen Planner is a comprehensive web-based membership management solution designed for gyms, martial art schools, boutique fitness studios and boxes. The software includes all of the features necessary to manage and grow your fitness business, and is especially great for single-location fitness studios. We particularly like the unique social features of Zen Planner -- members can keep track of their workout progress through the software, and compare their performance against their peers. This unique social interactivity promotes a sense of community, and holds members accountable for their progress. Various member self-service features, enabling members to reserve classes online, record workout results, and manage billing. Helps establish a sense of community -- members can interact with each other through the Member App, where they can Like and comment on each other’s workout results. Robust automated communication (prospect nurture campaigns, retention auto-emails) for customer relationship management. Ability to embed calendar, prospect forms, retail, sign-up and more on your website (for no additional cost). Offers automated billing with integrated payment processing. Lacks multi-location support, so is mainly appropriate for single-location studios. Does not include nutrition tracking. Currently doesn’t support online coaching. Monthly fee schedule based on number of members -- no hidden fees. Custom website for additional $149/month. Founded in 2006, Zen Planner is a comprehensive web-based fitness management software that is particularly popular across boxes and martial arts schools, as well as boutique gyms. Zen Planner is a feature-rich software that contains all of the functionality needed to help businesses grow and retain their client base. With its intuitive design and user interface, the software is very user-friendly, and we’ve found it to have a low learning curve. Since Zen Planner is a smaller company compared to some of its competitors, it’s able to provide exceptional customer support, which customers have said was a major reason they decided to use Zen Planner over its alternatives. Below, we discuss the key features of Zen Planner, and how they can benefit your fitness business. Zen Planner greatly simplifies the billing process, by enabling fitness businesses to get paid in a timely manner through automated billing. Members can benefit from the software by being able to easily view their current and upcoming bills, and pay them securely. Members can be assured that their financial data is secure as it is stored with PCI-DSS compliant third-party processors. Zen Planner also has integrated payment processing capabilities, which is included in the product via their billing partners PaySimple (US), Ezidebit (Australia) and PaySafe (Canada and EU). Marketing is one of Zen Planner’s biggest advantages over its competitors. A unique feature the software provides is the capability to keep track of prospective members, so that you can follow up with them and convert them to paying customers. The software makes it easy to send automated emails to potential clients, as well as existing customers. For example, it’s easy to send class reminders, and send friendly email reminders to members who haven’t shown up for a few weeks. This is a great way to keep clients engaged, and hold them responsible for their fitness results. Members can easily sign up for classes online or through Zen Planner’s mobile Member App. This helps businesses by enabling them to make sure that popular classes are adequately staffed. 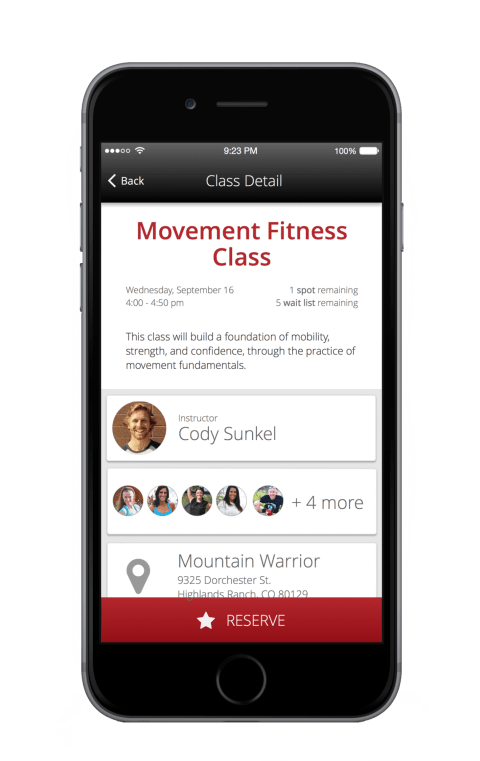 A nice feature of the Zen Planner calendar within the App is that it allows members to see the class instructor’s bio as well as other members who are registered for the class. Each class also has the option to maintain a waitlist if the class is full, which helps give members the best chance to participate in their favorite class. Zen Planner’s Advanced Workout Tracking enables members to track their workout progress over time, holding them accountable for their results. 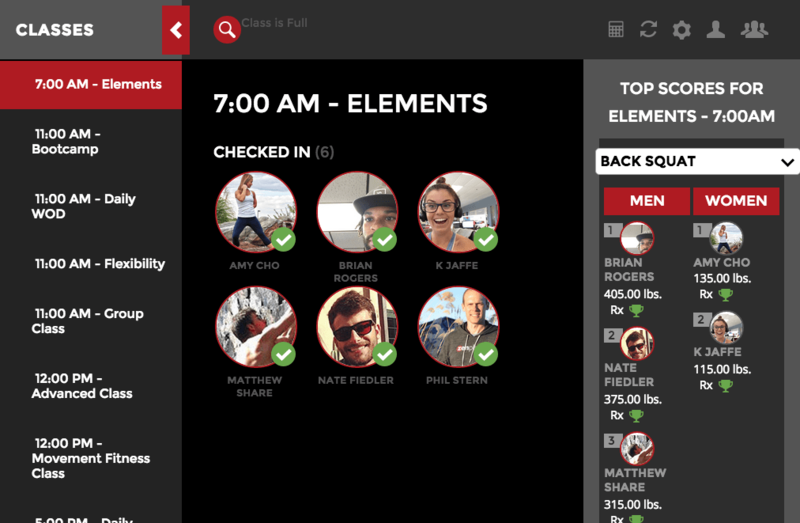 Instructors can enter the details of their workout or class, and members can record their results for the day. Then, members can compare their performance against their own historic results or against other members who completed the same workout, which can build a competitive community helpful in motivating members. Clients can also comment or ‘like’ other’s results to help motivate others, and celebrate progress or personal records. This social interactivity is great for building a sense of community, and is a unique feature to Zen Planner. 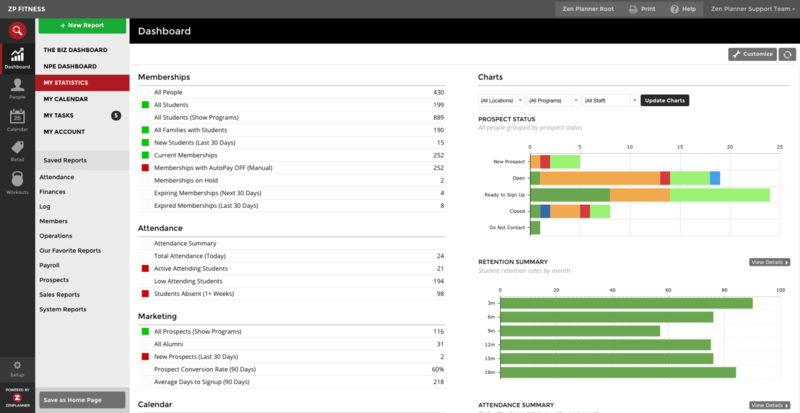 Zen Planner comes with a suite of reports to help businesses analyze their data and optimize their operations. Business owners can monitor their gym’s finances, keep track of student attendance, and identify failed payments as well as overdue bills. Monitoring these KPI is an important aspect to optimizing a fitness business, and is a great way to gauge how the company is performing. Zen Planner also has dashboards identifying members whose membership will be expiring in 30 days, so that they can be reminded to renew their membership. There’s also a report that keeps track of the reason members have decided not to renew, so that business owners can identify areas of improvement to increase customer happiness and retention. 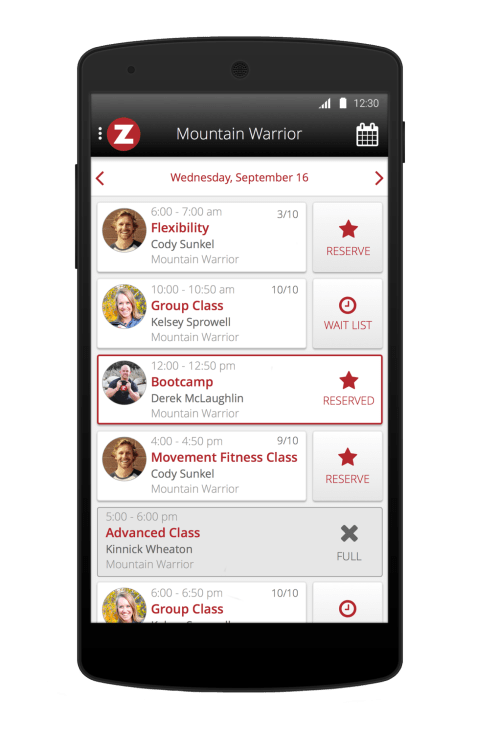 Members can use Zen Planner’s Member App from any Android or iOS phone to see class schedules, register for classes, pay bills, log their workouts, and interact with other members. The App also contains a leaderboard, where members can comment and “like” other member’s results and accomplishments. Daily tasks, such as checking members in for class, can be unnecessarily time-consuming. Zen Planner’s Staff App, available for both Android and Apple phones/tablets, simplifies many of these tasks, allowing you to spend less time behind a desk, and more time doing what you love. The App allows staff members to view their daily calendar so they can plan their day around popular classes, seamlessly check members in for class, appointments and events with a single tap, view and resolve issues with members’ accounts such as unpaid bills and unsigned documents and much more. One of Zen Planner's newest features is the ability to create custom websites for businesses, for an additional $149/month. This is ideal for smaller or newer businesses, who don't want to spend the time to create, optimize, and maintain their website. These days, not having a sophisticated website can be a turnoff for potential customers, especially when competing businesses have optimized websites. If you don't have experience building websites, it can make sense to outsource this work to Zen Planner's experienced team of website developers who will handle this work from end to end. However, it's important to keep in mind that the charge of $149/month is recurring, which can add up over the years. But this can be worth it for the convenience, and expertise that they offer. If you want to see an example of a custom site that Zen Planner made, you can check out PRO TKD's site. If you subscribe to this package, Zen Planner will create an attractive website for your business that can be viewed on both desktop and mobile, and also optimize it for SEO. You'll also have access to Zen Planner's support team, who can help you in the event that you need any additional changes to the site, or have any issues. All of these custom sites are capable of being integrated with Zen Planner, so that users can access class schedules, and make reservations. 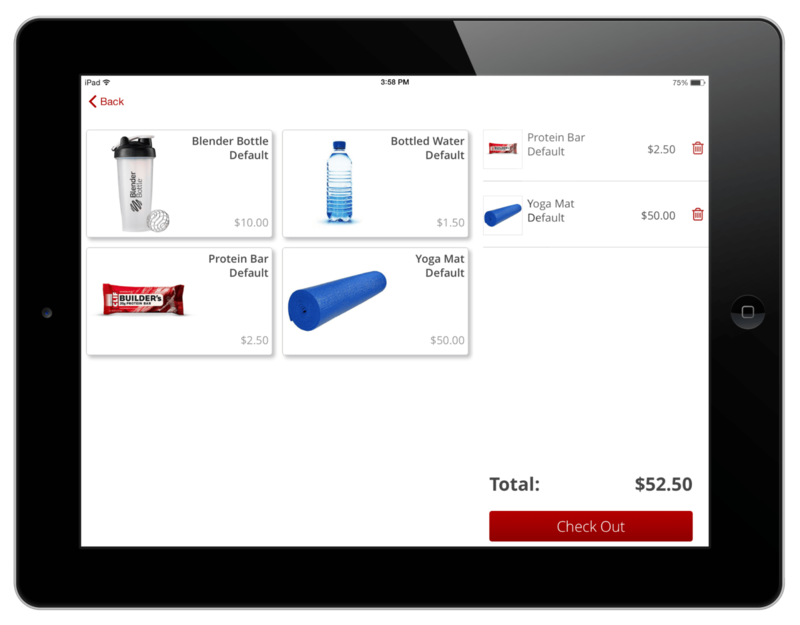 With Zen Planner’s self-service iPad App, members can sign waivers and contracts, purchase retail, and sign in for classes. The iPad Kiosk App reduces paperwork for businesses, as new members can sign up for memberships, input their contact information and sign important documents all within the App. The App also supports retail management -- members can purchase items from your store through the App, which is convenient for things like water or equipment necessary for the class. Members can purchase items through the website and iPad Kiosk App. Retail reports built into Zen Planner also help keep track of inventory and revenue. This can also be managed in the Staff App. Zen Planner is a complete web-based member management software ideal for small and medium-sized single-location fitness businesses looking to optimize their business. Zen Planner’s unique social features make it an ideal solution for tight-knit fitness communities, such as boxes, gyms and Martial Arts schools, looking to grow and retain their community. 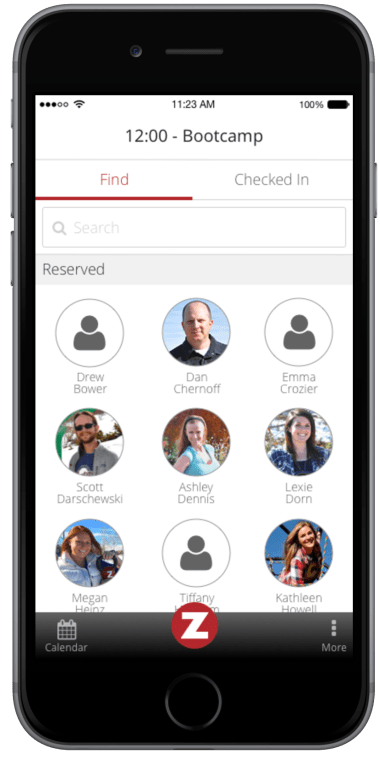 Zen Planner lacks multi-location support, so is not ideal for businesses with multiple locations interested in allowing members to freely attend classes in different locations.